Chicken as a meat has been depicted in Babylonian carvings from around 600 BC. Chicken was one of the most common meats available in the Middle Ages. It was widely believed to be easily digested and considered to be one of the most neutral foodstuff. It was eaten over most of the Eastern hemisphere and a hunter of different kinds of chicken such as capons, pullets and hens wre eaten. It was one of the basic ingredients in the white dish, a stew usuall consisting of chicken and fried onions cooked in milk and seasoned with spices and sugar. Chicken consumption in the USA increased during World War II due to a shortage of beef and pork. In Europe, consumption of chicken overtook that of beef and veal in 1996, linked to consumer awareness of Bovine spongiform encephalopathy or B.S.E. Preheat oven to 350 degrees. Grease a baking dish. Add chicken to a resealable bag, Italian salad dressing, salt and pepper. Making sure to coat chicken. 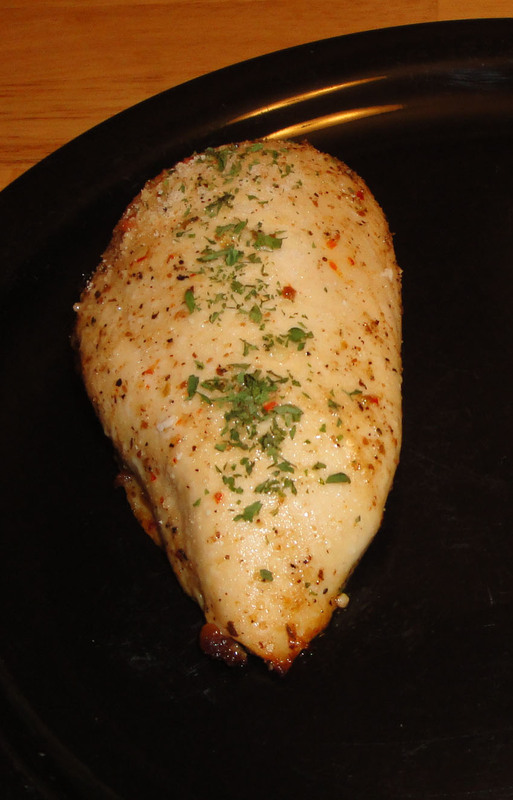 Place chicken in baking dish and cook for 25 to 30 minutes, or until chicken no longer pink in center. Garnish with cheese and parsley. Enjoy! Hi Holly, I'm sure it would be awesome grilled. Yummy! Yum! Nice back info as well...thanks! Love grilled chicken, so verstaile, healthy and so easy! Pairing this with a green salad is the perfect dinner. i love having chicken this way!!! Hi Christine! This chicken breast looks flavorful and tender! Thanks for stopping by and following. I appreciate your kind comments on my post! Hi Christine, the simple things are the best. I keep chickens, interesting to know where they came from. Hi Multi-Dimensional Life, The chicken was yummy! Thanks so much for stopping by. Looking forward to sharing. Hi Mike, I'm so happy that you enjoy the food history. It's interesting. Christine, I love not just learning a recipe from your blog... but the history behind it. You do a great job. I love using the italian dressing to make this chicken. I bet it really gives it a great flavor. Well done! Hi Curry and Comfort, thank you so much. You make me happy. I have a smile on my face. The chicken was awesome. My family was putting there dirty dishes in the sink and turn around and asked me when I was making Italian Chicken again. My family loves chicken and we never get sick of it. Your italian chicken is a winner! Hi Veronica, my family the same way. We all love chicken. Thanks. Hi Christine! Wow, very creative idea to use Italian salad dressing to marinate the chicken! Italian food's are my fav! looks great and soon to be in my kitchen! and thanks for stopping by my blog and for ur words or appreciation!! Easy and yummy chicken recipe! I love marinated meat! Thank you for stopping by my blog Christine! You have a beautiful blog too and I love your recipes! I'm following now! Hi Cook with Kelly, thank you so much! I appreciate you.